Yep, time flies, Summer is already far gone and Christmas is already around the corner, and we feel sometimes that we are stucked in our everyday routine. Hurry up, it’s time to wake up, hurry up, eat your breakfast, hurry up grab your school-bag, we’re running late… And that’s just the first hour of the day… Does that sound familiar? It does for me, and I’m pretty sure I’m not the only one. We would just like to be perfect, manage everything perfectly, fulfil all of our engagements, be productive and efficient at each and every single moment to avoid wasting any time, be the queen/king of home-made cooking, sewing, crafting, you name it, and all this of course being at the same time a perfect mum and perfect spouse. But do we really enjoy this everyday race? and that being said, a race is supposed to have a finish line somewhere, right? so what is our finish line? What are we racing for? 1- I’m no superhero. so I need to accept that everything is not always done perfectly. Sometimes (well….) my house isn’t perfectly clean and tidy, even if the fact that owning less helps tremendously to maintain a tidy house, sometimes I have a pile of laundry, or a pile of ironing (and sometimes both) waiting for me, sometimes I put my kids in front of a movie to have some quiet time to cook (or just for myself). The acceptance of our imperfection is I believe the key to stop being in a constant race for perfection, or just to look perfect (perfect mum, perfect minimalist, perfect zero-waste, again you name it) on our blogs, social medias, etc. 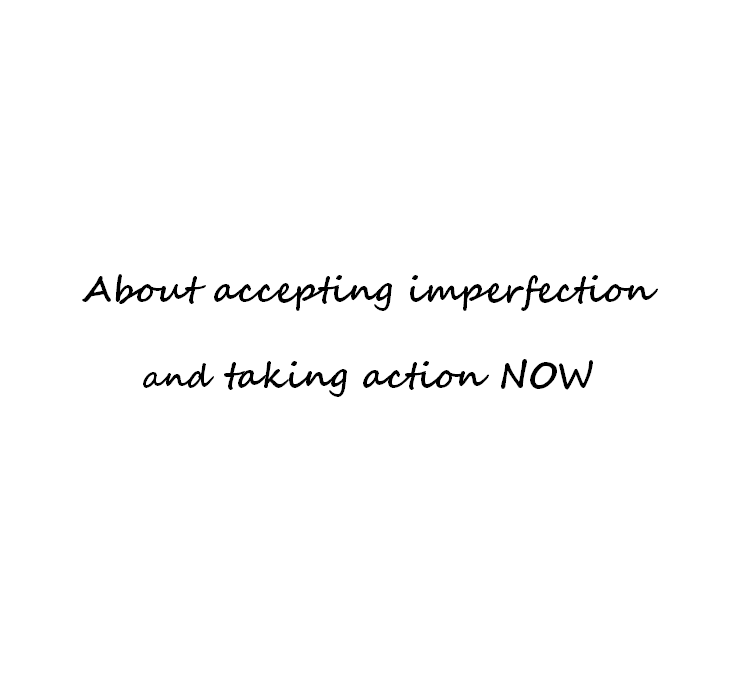 But accepting imperfection is also about stopping minimising what we do well. Because the more we focus on what we don’t do well enough, the less we realise all the little things we do, all the progresses we’ve made , the steps we took that make us who we are today. 2- the result of this constant race to perfection is also that we’re sometimes on the edge of the breaking point because of the pressure we put on ourselves (even more than the social pressure). So it is crucial to sometimes take a break. It’s ok to do nothing from times to times, even if everything isn’t perfect at home. We can just stop, sit and enjoy peace and quiet with a cup of tea, just to take few minutes to think or not to think. It really can help to recharge batteries and get back to work (or whatever you want/need to do) with a new energy and clear mind. We’ll be more efficient, more focused instead or running like chicken without heads in a daily routine that doesn’t even make sense anymore to us. 3- I’ve also learned to delegate or let others do things, others that are better at it than I am, and you know what? it’s such a relief! Of course I want to reduce my waste, and yes, home-made things are great, home-made cosmetics are awesome, just as handmade clothes, or jam or whatever… I’m doing quite a few things myself, but let’s be honest, I can’t do it all. I don’t have the time, nor the talent, and I don’t want to devote all my time to be this perfect mum that does everything herself perfectly. I decided to let go of the pressure and found some ecological/sustainable/ethical alternatives. There are so many awesome natural cosmetics out there that allow me to use great products without having to make them myself. There are an incredible number of craftsmen, local producers with very high ethics standards, who are using organic materials, so that we can buy great finished products in line with our values. So I do accept to rely on them, whose job it is to make things for which I have no talent for (my kids will thank me someday for not dressing them with homemade clothes), or that I just don’t want to do because I prefer spending my free time just being with my family. The minimalist/zerowaste/green lifestyle is not a contest, neither is being a good mum so I’m just trying to do what I can, and what I want to do, making sure that other things are done well somewhere else. 4- When choosing to live a more minimalistic lifestyle, I first thought about our belongings, the ones that I truly loved or that were really useful to us (and all the other ones that can be passed onto someone else). And then from objects I went on with all the other aspects of my life, and I really took time to reflect on what really matters to me, what I want to spend my time on, what is worth committing to. Minimalism is more than a trend, it’s a mindset that applies to all aspects of our lives and not only to belongings. It’s about focusing on what brings us happiness, and it’s common knowledge that our own happiness is kind of contagious, so it should not be seen as some kind of self-centered, selfish thing. I stopped keeping contact with people with whom I felt no natural connection anymore, to focus on the ones who I truly care for (so that our connection is growing bigger). I stopped running after new competencies that look good on CVs, or after those things that we should have read, or seen… And the released time and energy, I now use it for what really matters to my heart, what truly moves me now. As I could see more clearly what my desires were, I noted them and tried to see how I could implement them with concrete actions, concrete steps so that I wouldn’t stay in the ‘someday I wish I could …’ phase. 5- Take decisions and take actions NOW! It’s been a journey to know that we don’t need to be perfect to impress anyone (especially ourselves), that it’s ok to take time for ourselves sometimes and to step back from what fills our days and our lives. We’re accepting to delegate some tasks and things to others and with this released energy and time we have managed to see more clearly what we aim for, so NOW it’s time for action. Whatever your secret dream might be (and I’m not speaking only about things that implies spending some money), whatever moves you, there must be a way to get closer to it, to work toward making it happen. For me this was going for a part-time job from September. I feel very luck to have a job that allow us to live a comfortable life with a 80% job and I know that it can be difficult for a lot of people to do the same. This work pattern change has been on my mind for quite a while without daring taking the step to do it for reasons that were not that worth after all, and it has changed everything for me as it allows me to spend more time with my kids and be more there for them physically, but also mentally for my whole family the whole week. My family is everything to me and I’m really happy I made that change to spend more time with them. As you can imagine, those two changes, one big and the other smaller have both a great impact on how I live my life and everyone home is appreciating it so far. I also took action and registered for some Japanese courses. I’ve been wanting to do this for years (literally) but always put that aside for later, for ‘when I would have more free time’, until I decided that I would take the time NOW. All those changes (and some more) which make a real difference for me happened because I finally took action to make them happen NOW. It doesn’t really matter if it’s not perfectly done (because we all now perfection is not real), because the thing is that at least, something is happening, not just waiting on a wishlist that we look at once in a while. After a year of simplifying all aspects of my life, I came to the conclusion that that’s probably the main benefit of minimalism to me and that’s way better than just a neat wardrobe isn’t it? I would love to hear your thoughts about this and how you cope with this daily run to perfection or how minimalism has helped you to slow down and fully enjoy what really matters.